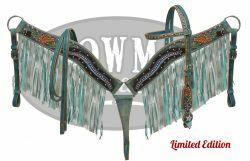 Showman ® LIMITED EDITION Light Teal Southwest 4 Piece Set. 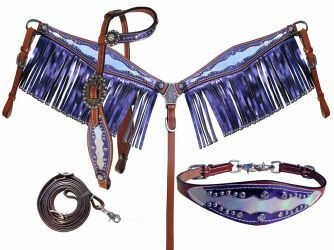 Showman ® LIMITED EDITION Purple and Silver Metallic 4 Piece HS/BC Set. 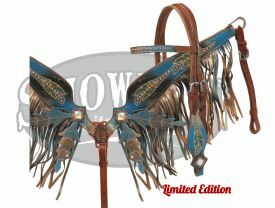 Showman ® LIMITED EDITION Turquoise Arrow 4 Piece HS/BC Set. 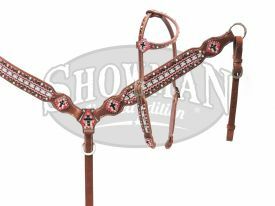 Showman ® LIMITED EDITION Pink Glitter Beaded Cross 4 Piece HS/BC Set. 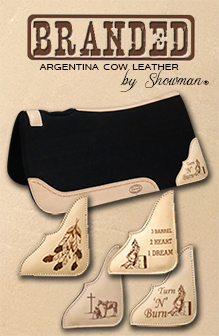 Showman ® LIMITED EDITION Teal and Black 4 Piece HS/BC Set. 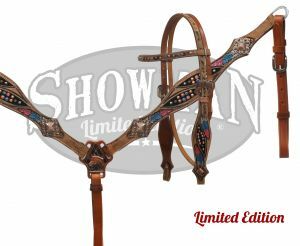 Showman ® LIMITED EDITION Turquoise and Black Stingray 4 Piece HS/BC Set. 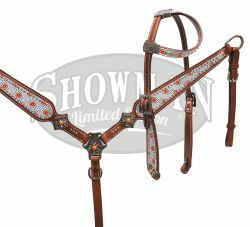 Showman ® LIMITED EDITION Red and Light Teal Southwest Diamond Print 4 Piece HS/BC Set. 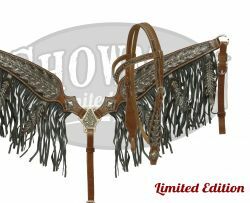 Showman ® LIMITED EDITION Black Stingray 4 Piece HS/BC Set. 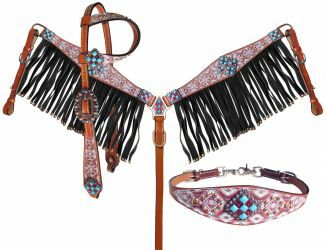 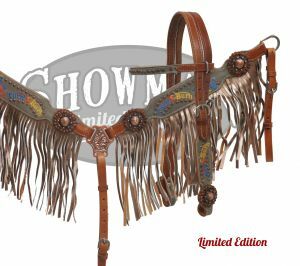 Showman® LIMITED EDITION Embroidered "Turn n Burn" fringe headstall and breast collar set. 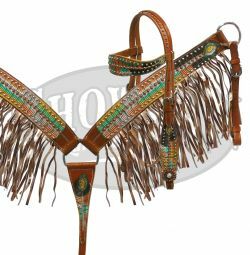 Showman ® LIMITED EDITION Painted oak leaf fringe headstall and breast collar set. 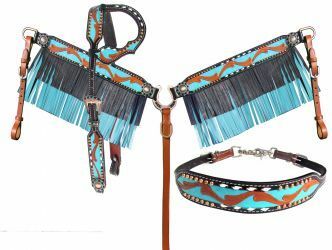 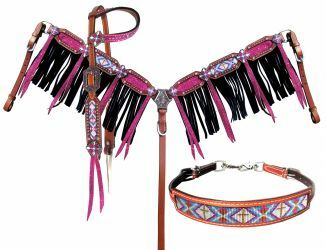 Showman® LIMITED EDITION painted feather design headstall and breast collar set. 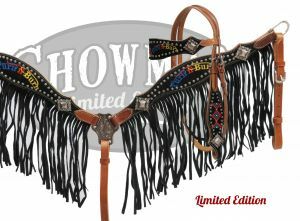 Showman® LIMITED EDITION Embroidered " Turn n Burn" fringe headstall and breast collar set. 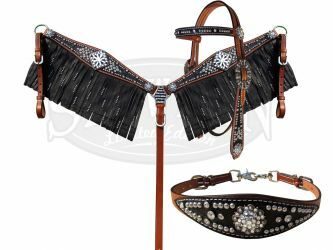 Showman® LIMITED EDITION Metallic painted peacock feather headstall and breast collar set. 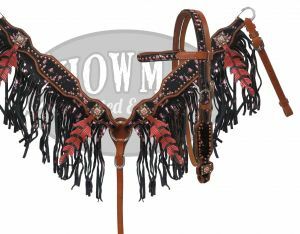 Showman® LIMITED EDITION Black oak leaf fringe set. 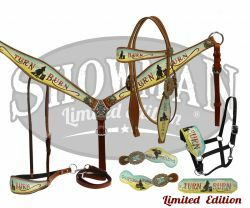 Showman® LIMITED EDITION 5 Piece Turn & Burn tack set. 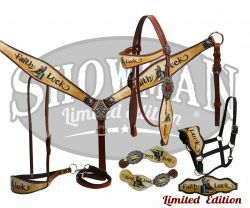 MSRP: $169.95 " Turn & Burn"
Showman® LIMITED EDITION 5 Piece Faith & Luck tack set. 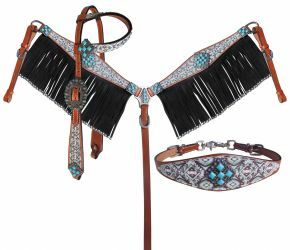 This set features medium oil leather with " Faith & Luck" design.